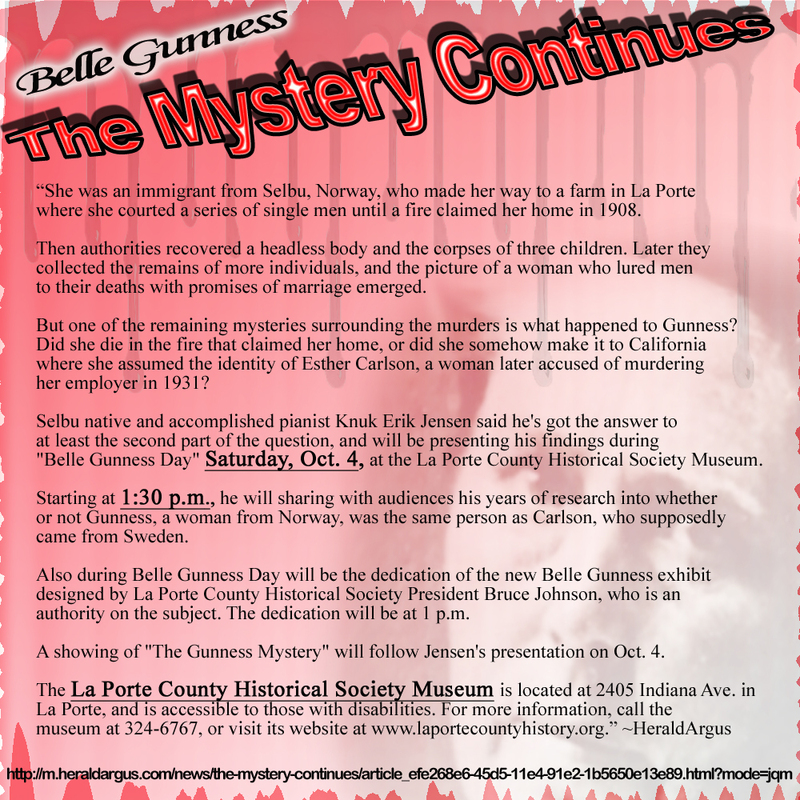 Saturday, October 4, 2014 at 1:00 pm dedication of the new Belle Gunness exhibit by La Porte County Historical Society President Bruce Johnson. Saturday, October 4, 2014 at 1:30 pm Selbu, Norway native Knuk Erik Jensen will share with audiences his years of research into whether or not Gunness was the same person as Esther Carlson, a woman later accused of murdering her employer in 1931. A showing of “The Gunness Mystery” will follow Jensen’s presentation on Oct. 4. There is a $6.00 fee for out of county visitors to the by La Porte County Historical Society, cash only. 2405 Indiana Avenue, La Porte, IN. Accessible to those with disabilities. For more information, call the museum at 324-6767, or visit its website at laportecountyhistory.org. 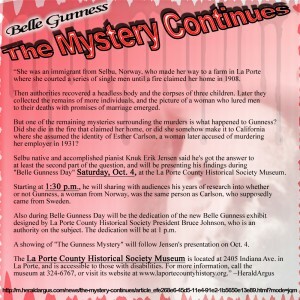 Posted in The Events, Website and tagged #BelleGunness, #LaporteIndianaMuseum, #MurderMystery.